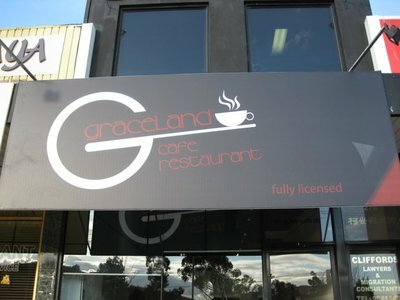 Graceland Cafe has become a popular venue in the Doncaster and Templestowe area. Their goal of becoming an icon in Melbourne is certainly becoming true. The owner of this fabulous suburban find is Roy, who charmingly greets guests with warmth and addresses regulars by name. The venue has warmth with deep red walls giving the venue sophistication. The service is kind and cheerful with water provided as soon as you are seated. Monday to Wednesday, the venue is open 7am to 5pm, serving breakfast and lunch. Thursday to Sunday, the venue is open till 10pm, also serving dinner. The menu can be described as modern Australian with Italian, Greek and Spanish influences. On this occasion, my party of four dined at midday on a sunny Sunday. Immediately we were greeted with a warm welcome by name (with my parents being regulars at the venue). The order included two fish and chip orders (one of which was happily made without flour batter due to an allergy) - this was described as delicate and flaky with thick fries that were perfectly soft on the inside and crusty on the outside and a small salad. A delicate tartare sauce was also included with a complimentary mild flavour. Another guest ordered the 'Amazing Burger' with fries and salad. The burger includes a lean beef pattie, bacon, fried egg, caramelised onion, tomato, cheese and relish. The burger did not disappoint. I ordered two boiled eggs and a side of grilled tomatoes; my only note being that I would have preferred to remove the shell myself (as sometimes stray bits get left in the shell). Coffee was also ordered and in addition to tasting great, it came with unique foamy designs created by the owner himself. A wonderful restaurant with great food and service. I know ill be back! Why? A popular venue in the Doncaster and Templestowe area.